As part of a deal announced Monday night, Microsoft will take control of the largest maker of smartphones running its struggling Windows Phone operating system. It will also see the return of Stephen Elop, a former executive who oversaw Nokia decision to switch to Windows Phone soon after becoming CEO of Nokia. Elop, who had already been rumored to be a candidate to replace outgoing Microsoft CEO Steve Ballmer, will head Microsoft’s new device’s division once the deal is completed. In a statement, Ballmer said the deal would be a “win-win” for both companies. For Microsoft, the deal will speed growth and profits in mobile phones, he said. In an email to employees that was released to the press, he noted that it was of a piece with a major reorganization the company announced in mid-July. “This is a bold step into the future and the next big phase of the transformation we announced,” he said. As part of the agreement, Microsoft will pay Nokia 5.44 billion euros, or about $7.2 billion. That amount includes about 3.79 billion euros — about $5 billion — for “substantially all” of Nokia’s devices and services business and another 1.65 billion euros — about $2.2 billion — to license Nokia’s patents. The deal, which requires the approval of shareholders and regulators, but has already been approved by the boards of both companies, is expected to close in the first quarter of next year. The companies plan to discuss the move early Tuesday morning on a conference call with investors, analysts and the press. In the early part of last decade, Nokia dominated and Microsoft was a significant player in the smartphone market. But both companies were slow to react to the launch of Apple’s iPhone, which helped transform the market. Both companies have seen their market share plummet amid the onslaught first of the iPhone and then of phones running Google’s Android operating system. Both companies have tried to rebound. In 2010, Microsoft launched Windows Phone, a new smartphone operating system that was designed for full touchscreen phones, but was incompatible with its older Windows Mobile software. Two years ago, under Elop, Nokia announced that it was ditching its Symbian operating system, which had long been the standard for smartphones, in favor of Windows Phone, which was completely incompatible with Symbian. Even after the changes, both companies continued to lose market share as neither made much of an effort to lure customers of their older phones or software to their new products. In the second quarter of this year, Windows Phone-powered devices comprised 3.3 percent of the smartphone market, according to Gartner. That was up from just 2.6 percent a year earlier, but the result put Microsoft’s operating system in a distant third place behind Android and iOS, which powers the iPhone. Though it ranked as the top selling smartphone vendor for years, Nokia didn’t rank even among the top five vendors in the second quarter. Since its embrace of Windows Phone, Nokia’s fortunes have plunged. In 2010, the company earned 1.85 billion euros, or 50 euro cents a share, on sales of 42.4 billion euros, according to the company’s most recent annual report. Last year, by contrast, the company lost 3.1 billion euros, or about 84 euro cents a share, on 30.2 billion euros in sales. Last year, the company shipped 35 million smartphones, compared with 77 million the year before. Although the company’s loss has narrowed in the first half of this year, its sales have continued to decline. Amid the sales and market share decline, Nokia has laid off thousands of employees, cut its dividend to zero and has seen its stock price fall off a cliff. It remains to be seen how other vendors of Windows Phone devices will react to the announcement. Besides Nokia, other vendors had released few devices running the operating system, with most instead choosing to focus on Android. The move represents the latest round of consolidation in the smartphone industry. Last year, Google bought Motorola, which had decided to focus solely on making smartphones running on Android. In 2010, Hewlett-Packard, in an effort to jumpstart its smartphone business, bought Palm. Neither acquisition turned out particularly well. H-P shut down Palm a little more than a year after acquiring the company. While Motorola is still in business — and recently launched a new flagship phone — it has become little more than an also-ran in the smartphone market. 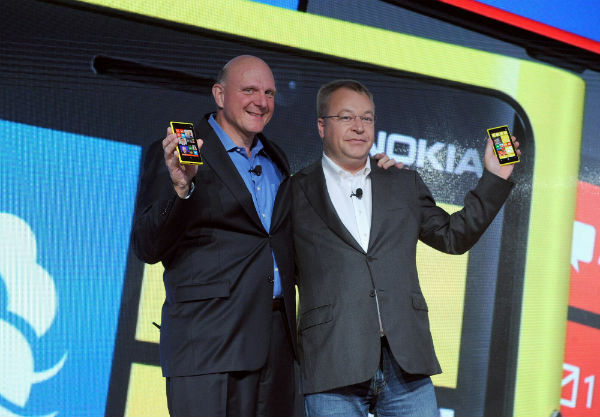 Photo, of Microsoft CEO Steve Ballmer and former Nokia CEO Stephen Elop, courtesy of Nokia. This entry was posted on September 3, 2013 by techinamerica in MICROSOFT and tagged Android, IPhone, MICROSOFT, Nokia, Stephen Elop, Steve Ballmer, Windows Mobile, Windows Phone.